Battle with swords and whips in this retro-style action game brought to you by game creator Koji Igarashi and Inti Creates! Play as Zangetsu, a demon slayer bearing a deep grudge, who must travel through perilous lands to defeat a powerful demon lurking in a dark castle. Zangetsu will meet fellow travelers along the way, who can join your journey as playable characters. Switching to these characters with their unique abilities will unlock new paths through the treacherous stages. Your choices in recruiting these adventurers will change the difficulty of the game, and may even affect the ending! Bloodstained: Curse of the Moon was released on Xbox One 324d ago in the US and the UK. 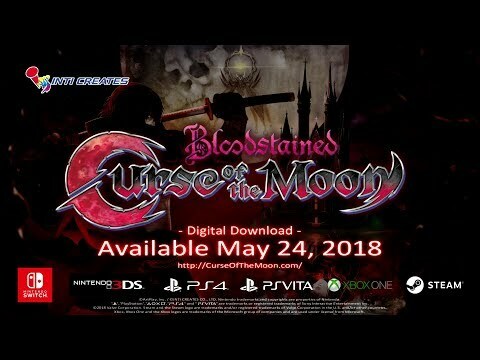 Notify me when Bloodstained: Curse of the Moon is available. Based on 3 Bloodstained: Curse of the Moon reviews, Bloodstained: Curse of the Moon gets an average review score of 80. Bloodstained: Curse of the Moon is a Castlevania III homage that plays dangerously close to its source material, but introduces interesting ideas that make it highly replayable. Even though it's short and has its frustrating moments, long-time fans of the series will find a lot to love here.